During Semana Santa (Easter Week) I had the opportunity to travel to Bolivia. On Wednesday night we took the bus from Cusco to Puno and arrived around 5.30am. At the bus station we looked for a bus to Bolivia and Thursday morning at 6.00am we were on our way to Copacabana. In the early afternoon, we arrived safely in Copacabana. The bus companies we travelled with were very safe and comfortable. In Copacabana we had a nice lunch, the trout was delicious, and we decided to take the boat to Isla del Sol. After one and a half hour we arrived at the south side of the Island. People say that this is the touristic part of the island and yes I have to say it is. However, if you spend the night at Isla del Sol it is very relaxing. It felt like we were all alone on the island. At Isla del Sol there are no paved roads and motor vehicles. Approximately 800 families live on the island. These families make a living of farming, with fishing and tourism increasing the economy. Over 80 ruins can be found while walking around. In the religion of the Incas, it was believed that the sun god was born on the island. The next morning, we took the first boat back to Copacabana. This time it was a lot more crowded, because of Semana Santa people were camping next to the lake and everywhere there were stands where you could buy all kinds of food. It was so much fun to see this big holiday happening. The weather was lovely and we enjoyed a day in the sun, eating trout and walking around the town looking for souvenirs. In the evening we took the bus back to Puno. The bus ride from Copacabana only takes 2 and a half hours but since you have to cross the border the journey takes a bit longer. Once we arrived in Puno we went straight to our hotel. 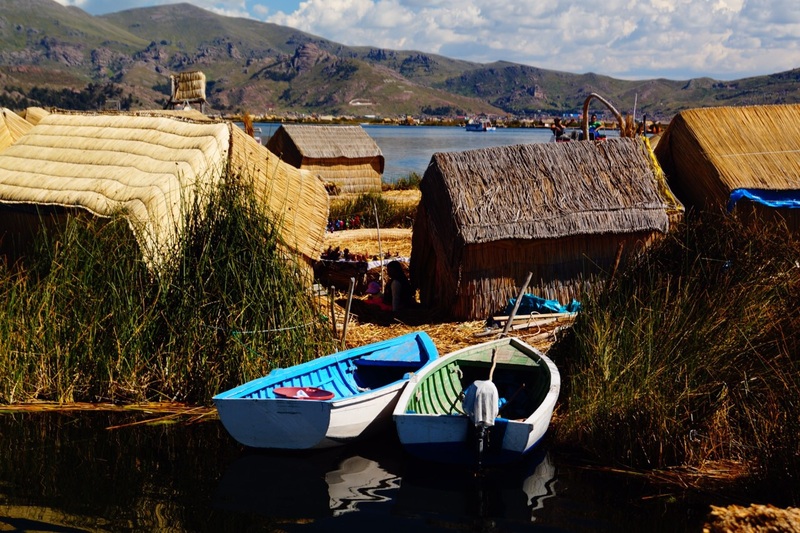 The next morning we went out to explore the city of Puno. We had a nice breakfast at a cozy coffee bar and afterwards we returned to our hotel where our guide picked us up to start our tour of Lake Titicaca. We booked a half day tour visiting the Uros floating islands. 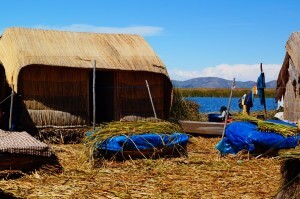 The islands, houses and boats of the residents are made of tortora rushes. The weather was lovely, and the sun was shining bright. We boarded a boat and made our way to the islands. The boat ride took about 10 minutes. We got off the boat and visited one of the islands. There were 6 families living on the island and we could look in their houses and take pictures in traditional clothing. We could also buy souvenirs on the island. It was a very touristic happening but nevertheless, I enjoyed it very much. To get a better experience it is also possible to stay at the islands for one night. After the tour we had lunch at another island and following on we made our way back to Puno. In Puno we took the night bus back to Cusco.